Well, it's Monday ... again. My mood has not improved by much over the weekend, unfortunately. I am living in a state of limbo where things seem to happen around me but I have very little interest in them or doing anything else. All I want to do is curl up in my pyjama's and watch series or read my latest book. 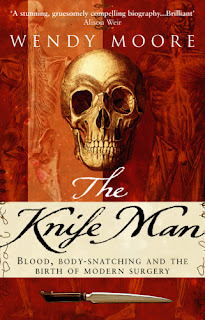 Oh, and for those of you interested, I here is the review of my last book, the very interesting Knife Man by Wendy Moore. This title is the winner of the Medical Journalists' Open Book Award 2005. Revered and feared in equal measure, John Hunter was the most famous surgeon of eighteenth-century London. Rich or poor, aristocrat or human freak, suffering Georgians knew that Hunter's skills might well save their lives but if he failed, their corpses could end up on his dissecting table, their bones and organs destined for display in his remarkable, macabre museum. Maverick medical pioneer, adored teacher, brilliant naturalist, Hunter was a key figure of the Enlightenment who transformed surgery, advanced biological understanding and even anticipated the evolutionary theories of Darwin. He provided inspiration both for Dr Jekyll and Dr Dolittle. But the extremes to which he went to pursue his scientific mission raised question marks then as now. John Hunter's extraordinary world comes to life in this remarkable, award-winning biography written by a wonderful new talent. This was a very interesting read and I can only agree with akika when she says she's grateful for all the advances of modern medicine but even more grateful that she wasn't one of the folks around in the mid-eighteenth century who needed medical assistance. I think for me what was so fascinating, since we're all so used to how medicine works these days and that all new medical advances should go thru a number of tests and trials before being let loose on the general public, is how differently things worked back in the day. The number of "surgeons" of the day who were obstinately opposed to testing new theories, or even to thinking for themselves is frightening. I for one am heading onto Google right now to see where Hunter's preparations from his museum can be found (if any have survived to this day & age). Hmmm, so what did we do this weekend? Friday was very lazy, I think. I can't even remember what we had for dinner ... oh yes, random snack-type stuff from Woolies. Saturday we were up fairly early and headed off to do much-needed curtain shopping for Varen's place. He managed to find the perfect stuff at Mr Price Home :) Unfortunately we still had to go back again twice since he bought the wrong sized curtain rods and then after finally hanging them, we realised he needed an extra curtain for each window. Varen also made us a lovely lamb dinner (using his new oven gloves!) and we settled in for a quiet night. I would've preferred a quiet Sunday too, but it wasn't how things worked out. We made our last trip to Mr Price Home and went to view another show-house. Blegh, I'm still miserable. I've pretty much worked out that I can't even afford land in the areas I want to buy ... let alone inhabitable housing. So, I don't want to talk about it. After that, we browsed the (not so new anymore) World Wear centre - will have to go back when I'm in a shopping mood and have more time :) And then we went to Varen's and hung the last of the curtains and got rid of the black bags on the windows for good :) It's really looking lovely.